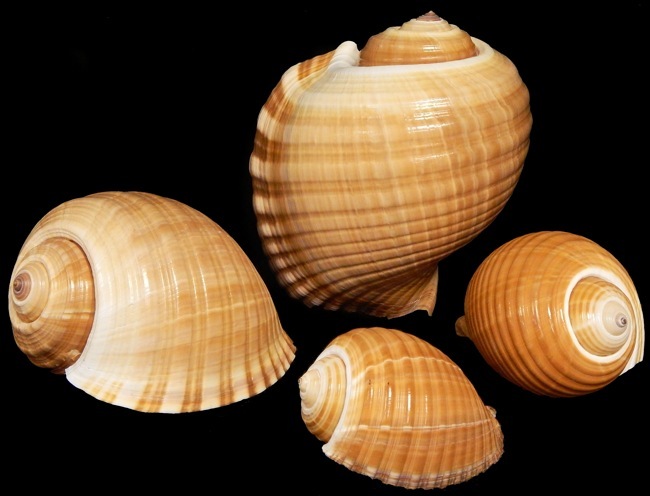 Tonna Shells Belong to the Tun family of spherical and often large, relatively thin shells, with a depressed or low spire. 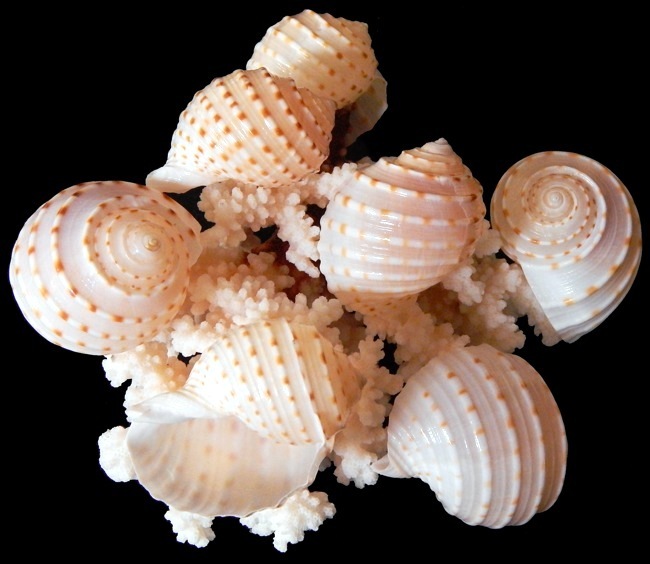 This shell family prefers tropical seas and most are found living in sand beyond the edge of the coral reef. Most species dwell in the Indo-Pacific region ranging from Eastern African shores further east across the northern Australian-New Zealand shoreline. Tonna Oleria is a large, thin lightweight shell. The body whorl has 15 to 20 broad flattened , spiral ribs with lesser ones between. Color is a chestnut brown with paler vertical streaks. The outer lip is white, edged in brown. This species is widely found in most seas due to its free swimming larval stage. It prefers deep water. They are moderately common. Description. The Tonna Tessalata or Spotted Tun is large, fragile, spiracle with a low spire. The outer lip ends in a shallow siphonal notch. The body whorl has between 10 to 20 spiral ribs. The ribs are colored with white, cream or pale brown, with square like blotches on ribs and the apex is brown. This species ranges from the western Indian Ocean east to the northern Australian-New Zealand shore and north to southern Japanese shoreline. The average size of captured shells is 5 inches and they are considered moderately common. Scientific name is Tonna Dolium. Description. 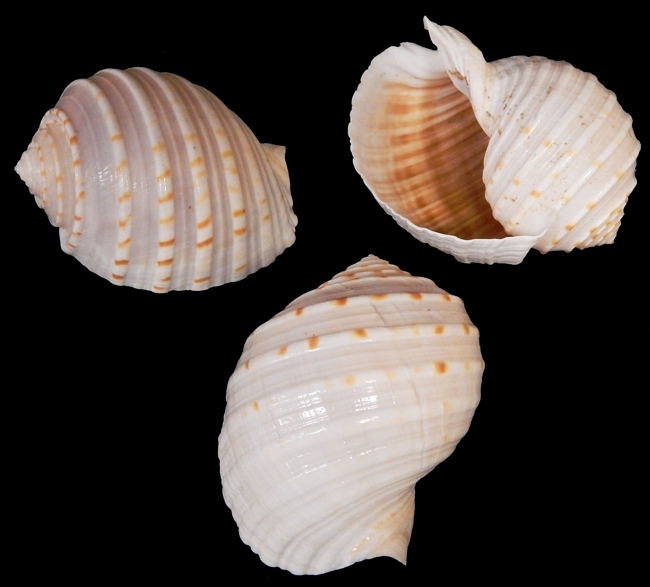 The Indian Tonna Tessalata or Spotted Tun, small version of the Tonna Tessalata shell but referred to as the Indian Tonna. They are small, fragile, spiracle with a low spire. The outer lip ends in a shallow siphonal notch. The body whorl has between 10 to 20 spiral ribs. The ribs are colored with white, cream or pale brown, with square like blotches on ribs and the apex is brown. This species ranges from the western Indian Ocean east to the northern Australian-New Zealand shore and north to southern Japanese shoreline. The average size of captured shells is 5 inches and they are considered moderately common. Scientific name is Tonna Dolium. Description. 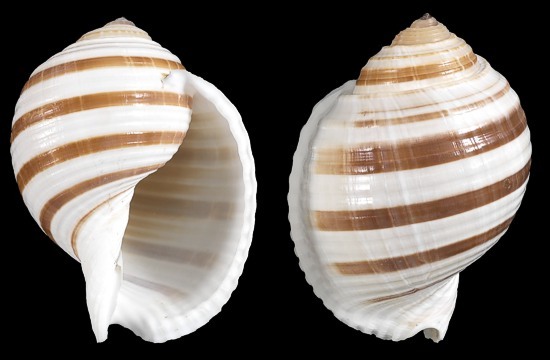 The Tonna Selacosa or often called the Banded Tun, from the family Tonnidae. This is a thin sturdy and rather small shell compared to other Tun Shells. 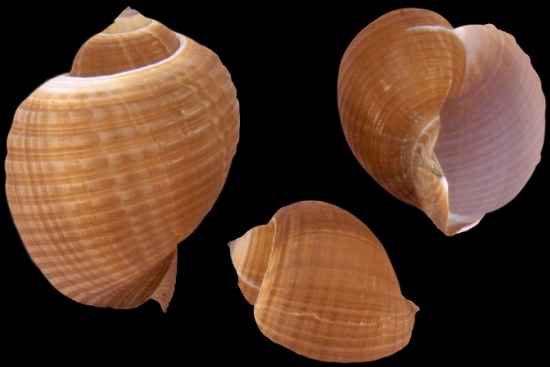 The Banded Tun is spherical and has around 7 whorls (complete turn of the shell on its imaginary axis) separated by a channeled suture (the line on a gastropod shell where the whorls connect. Early whorls have thin spiral riblets. There are four to six strong spiral ribs on the penultimate (near the shell apex)whorl and up to 21 ribs on the body whorl. 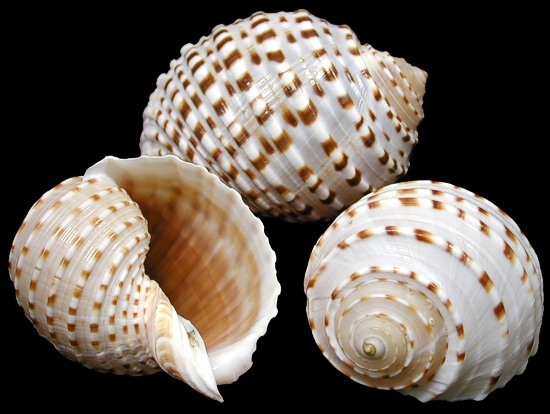 The Banded Tun shell color is creamy white, with three or four dark brown spiral bands on the body whorl. The aperture (the opening at the front end of the gastropod and tusk shell). 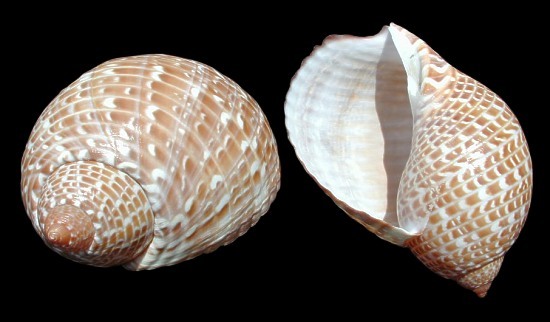 While the mollusk is living the shell is covered with an opaque, dark brown periostracum (The external often fibrous material coating covering many "living" shells). The tonna sulcosa is found across the Indo-Pacific region stretching from Western Indian ocean east across The Western Tropical Pacific to the northern shores of Australia-New Zealand. This species mostly found in off shore waters. Description. The Tonna Perdix sometimes called the Pacific Partridge Tun. 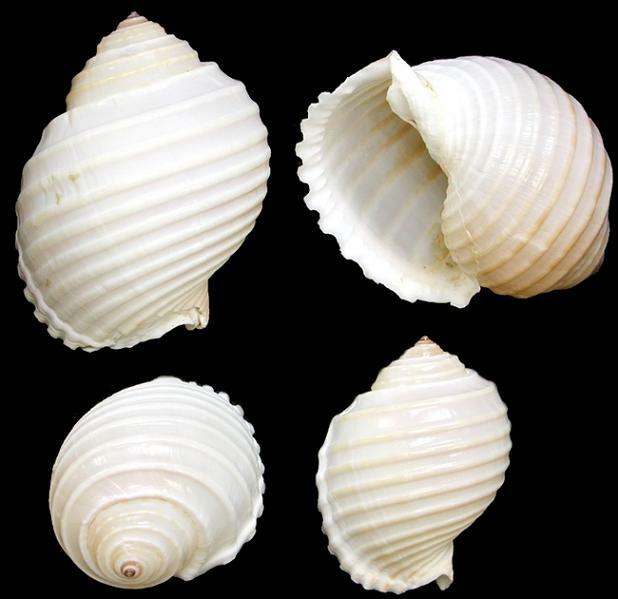 It is a very large and fragile shell with whorls that slope at the shoulders. The spire is pretty high and the body whorl widely expanded. It has a impressed suture that is not channeled. The outer lip is a little thick but not toothed. It has broad, flat spire ribs separated by shallow grooves. The color is brown with cream crescents and dashes between grooves. The aperture is brownish and outer lip white. The color is said to resemble plumage of the European partridge. The Pacific Partridge Tun shell/Tonna Perdix is found in the Indo-Pacific region from Indian Ocean across the Tropical Pacific to the northern shores of Australia/New Zealand. They prefer off shore waters.